Hi friends, after a terrible weekend and ending up with a migraine, I am totally tired, and when I saw the date I knew if I don’t do it today I am going to miss an other event, for which I made this few days back, but never got the time to post, I missed the last one and could not post it on time. yes, I think you all got it, Nupur’s One dish meals, I hope she likes this..
As I was searching from all the bloggers what will I cook, I saw this in Viki’s kitchen, I love all kind of pulavs, biryanis, and needless to say my family loves them too.., at least twice in a week I love to eat all kind of veggie Rices. I wanted to make something nice that day as my H called me and said our friend from India would be visiting us, He came that night and left early morning, it was such a short trip and we were upset as he was not able to stay with us a little longer. well, anyways whatever time he was with us was just fine and after a long time we were able to meet each other. Coming back to the recipe, Viki is one of my favourite bloggers, with lots of varied recipes and her most interesting one which I have to still try it out, but keep going their to look at it now and then, my favourite tuti-frootis. Some day I will make them soon and post some recipes out of it, fingers crossed. 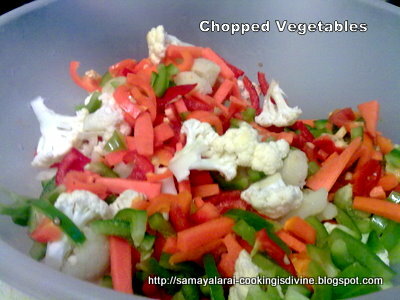 Chop the vegetables into long strips, and other vegetables accordingly like florets of cauliflower etc., (Viki said to put with all the above ingredients to mix together and put them in the bottom of the dhum vessel, but I did not do that way). This is how I did it, and tweaked the recipe a little bit. I took an other wok, took more than 2 tbsp of ghee, added the G-G paste, then the vegetables and the when they were half way cooking I added chilly powder, salt, turmeric powder and made a powder of the masala under the flavoured water I roasted and powdered the Green chilli, cinnamon, clove, cardamom, Shahi Jeera, Mace and nutmeg with 3 tbsp of Shaan Brand Biryani Masala powder. Next in the same wok I poured 2 tbsp of oil and then fried the chopped onions until golden brown I used Red onions, do not fry it too much it starts giving a sour taste, after frying I kept them aside on to a plate. Then I took an other 2 tbsp of Ghee and fried Cashews and Raisins and kept them aside. Then I took a cup of yogurt added a bit of salt, and kept aside. Then I cut Bread slices into cubes and fried them in ghee, Instead of soya chunks I used Paneer fried them too and kept aside (sorry cannot show in photo, as I am not able to trace it, if I find it in my haystack of clicks I will update it). First of all I took my tawa and heated it on the stove top, while I was arranging this Biryani, In a medium flame. Cover the vessel with the dough then tightly close the lid and place this on the tawa and allow it cook in low flame, this method of slow cooking will ensure that it is well cooked and aroma, is spread throughout the dish. Even you can cook in the oven in a slow cook for around 1 and 1/2 to 2 hours. I cooked on the stove over the tawa, until my friend came home. Wow! This one looks perfect. I have never tried making one. This is worth a try. Wow wat a prefect looking briyani, looks fabulous, makes me hungry..
viki that was so quick, I still was not getting it right to post! and sent me these lovely words, thanks dear, I owe it to you..
Ms.Chitchat,Chitra, Jeyashri your appreciation goes to viki, It was her recipe., do try it out and check out her blog on the link to see more details. Hi Simran, It all started with my friend passing away. Saturday morning recieved the bad news cried myself so much ended up with a migraine, and once it attacks that stays for 3 to 4 days, hope you are feeling better. Oh!thanks for the compliments dear. Biryani looks amazing. Perfect biryani and a perfect click too. 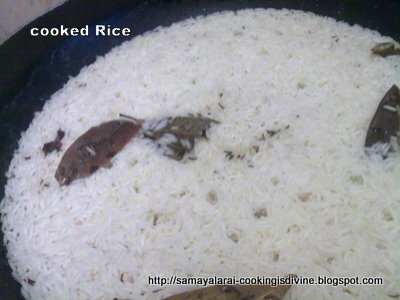 Biryani has come out perfect dear. Thanks for trying out and that nice anecdote. Lovely clicks too.